May was conference month. Four conferences and a wedding. Reading took a hit, but I did finish two books this month. I expect June will be light too for other reasons. Modern Romance by Aziz Ansari was a delightful surprise. I enjoy reading books by comedians, but this isn’t like those. Modern Romance is a well researched (and humorous) dissertation on (surprise) modern romance. It has never occurred to me how much the world of romance has changed. Of course romance and the tools we use to find a mate have changed – everything else has changed including the way we work, the cars we drive, and the TVs we watch. Aziz starts the book with interviews with seniors to set the baseline. Turns out Mayberry was real – people just married people in town — women often married to get out of their parent’s house. Today, we tend to get married later in life and technology and careers changed everything. Modern Romance covers texting and sexting, how social protocols have changed, computer dating including Tinder, modern affairs, and more. There’s also some international comparisons with France, Japan, and Argentina (how do I get one of these concubines?) It’s a fun and educational book. There are so many nuggets in here that apply to broader categories. For example, it’s never been easier to meet people, but the paradox of choice is keeping us single. Also, there’s more to arranged marriages (and Tinder) than I thought. 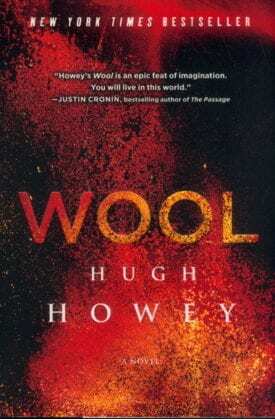 Wool by Hugh Howey was indirectly recommended to me by Tsahi Levent-Levi. Actually, he recommended it to my son who never read it — so I did. The author started the tale as a self-published web post was so popular it turned into a published book series and a film in development. It falls into the Dystopian Future sub-genre of scifi. The world is so toxic that life now takes place in a underground in a 144 floor silo (the dystopian part is there is no elevator). It’s a stratified city (on many levels!) complete with a Mayor and Sheriff. The scifi part is that the IT team may be evil. But unlike last month’s The Road, this is a bit more of a feel-good dystopian book as the masses rise against IT. Tsahi was right – it’s a good book, especially for younger readers.